The Russian Progress 66 launched at 12:58 a.m. Wednesday (11:58 a.m. Baikonur time) from the Baikonur Cosmodrome in Kazakhstan. The vehicle will deliver almost three tons of food, fuel and supplies to the Expedition 50 crew. The spacecraft is set to dock to the Pirs docking compartment at 3:34 a.m. Friday, Feb. 24. NASA TV coverage of rendezvous and docking will begin at 2:45 a.m. Progress 66 will remain docked at the station for almost four months before departing in June for its deorbit into Earth’s atmosphere. This was the first launch of a Progress cargo ship from Baikonur since the Progress 65 supply craft was lost Dec. 1, 2016. A SpaceX Falcon 9 rocket lifts off from Launch Complex 39A at NASA’s Kennedy Space Center in Florida. This is the company’s 10th commercial resupply services mission to the International Space Station. Liftoff was at 9:39 a.m. EST from the historic launch site now operated by SpaceX under a property agreement with NASA. Two cargo craft are scheduled to deliver several tons of supplies and experiment hardware to the station this week. 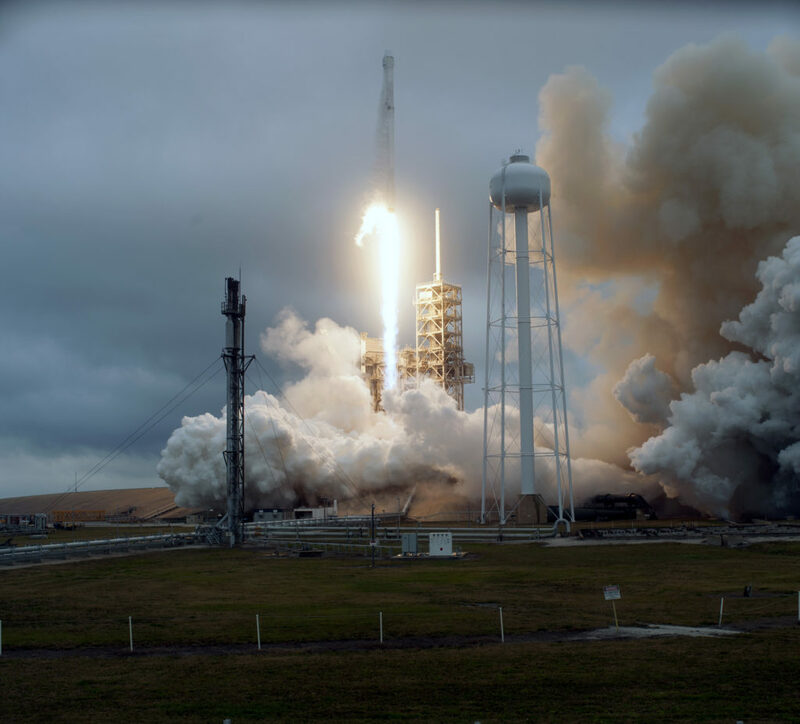 SpaceX’s tenth commercial resupply mission lifted off at 9:39 a.m. EST on Sunday, Feb. 19. The rocket launched from Launch Complex 39A at NASA’s Kennedy Space Center in Florida. This was the first commercial launch from Kennedy’s historic pad. Astronauts Thomas Pesquet of ESA (European Space Agency) and Shane Kimbrough of NASA will use the space station’s robotic arm to capture Dragon when it arrives at the station. Live coverage of the rendezvous and capture will begin at 4:30 a.m. Wednesday, Feb. 22 on NASA TV and the agency’s website, with installation coverage set to begin at 8:30 a.m. 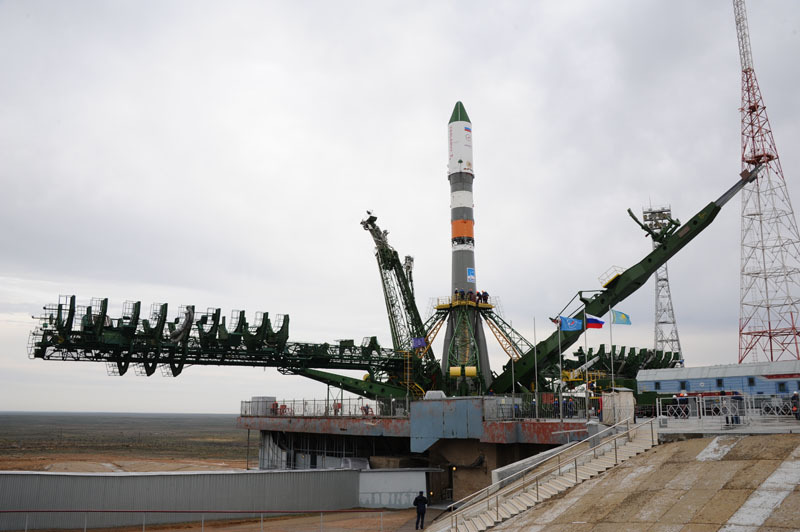 Meanwhile, the unpiloted Russian Progress 66 is scheduled for 12:58 a.m. Wednesday (11:58 a.m. Baikonur time) from the Baikonur Cosmodrome in Kazakhstan. 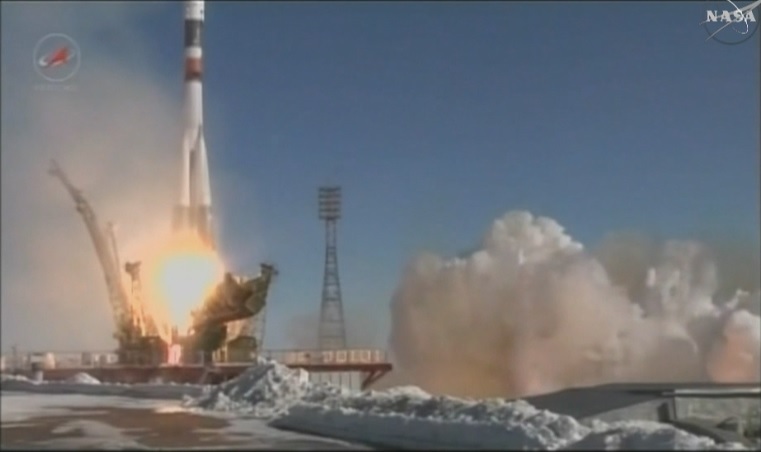 The spacecraft is set to dock to the Pirs docking compartment at 3:34 a.m. Friday, Feb. 24. Aboard the station, the crew continued preparations for the arrival of the vehicles and set up several scientific experiments and technology demonstrations. The Miniature Exercise Device (MED-2) was installed for a technical evaluation. MED-2 aims to demonstrate if small robotic actuators can provide motion and resistance for crew workout sessions, reducing the size and weight of exercise equipment for long-duration space missions. Soyuz crew (left to right) Aidyn Aimbetov, Sergey Volkov and Andreas Mogensen are set to launch at 12:37 a.m. Sept 2. 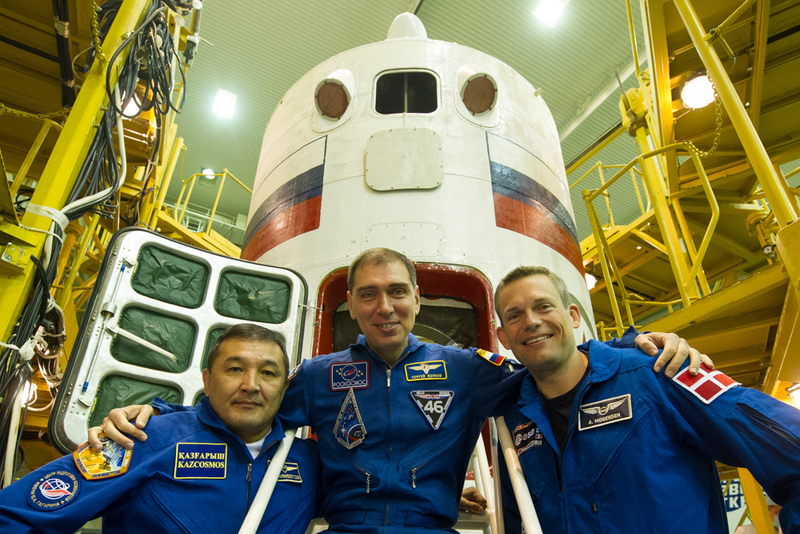 An international crew of three is ready for a two-day ride to the International Space Station. The Soyuz rocket that will lift them to space is set to launch tonight from the Baikonur Cosmodrome in Kazakhstan at 12:37 a.m. EDT Wednesday, Sept. 2. Veteran cosmonaut Sergey Volkov will command the Soyuz TMA-18M spacecraft. Joining him for the trip to the station will be first time flyers Andreas Mogensen from the European Space Agency and Aidyn Aimbetov from Kazcosmos, the National Space Agency of the Republic of Kazakhstan. Meanwhile aboard the station, One-year crew members Scott Kelly and Mikhail Kornienko continued their Human Research Program studies today taking measurements for the Fluid Shifts study and Fine Motor Skills. JAXA astronaut Kimiya Yui is continuing work to reconfigure the Cell Biology Experiment Facility (CBEF) to support the new Mouse Habitat Unit (MHU) delivered on HTV-5. NASA astronaut Kjell Lindgren is performing post-transfer work on the newly arrived Multi-Purpose Small Payload Rack (MSPR)-2.